The sound of the steam trains provides a lovely backdrop to the traditional ford crossings around the station. RATING: Used as a shortcut by locals the green lanes that pass Dale End Farm from Braithwaite make a very a scenic drive. 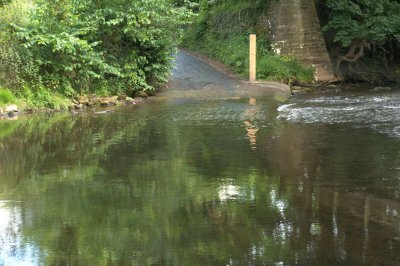 The ford across the River Esk can be deep and fast flowing at times so check depth markers before crossing. 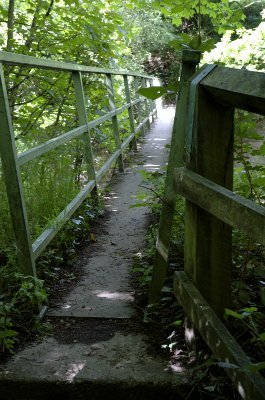 The byway is easy to spot with its 'unsuitable for motors' sign. 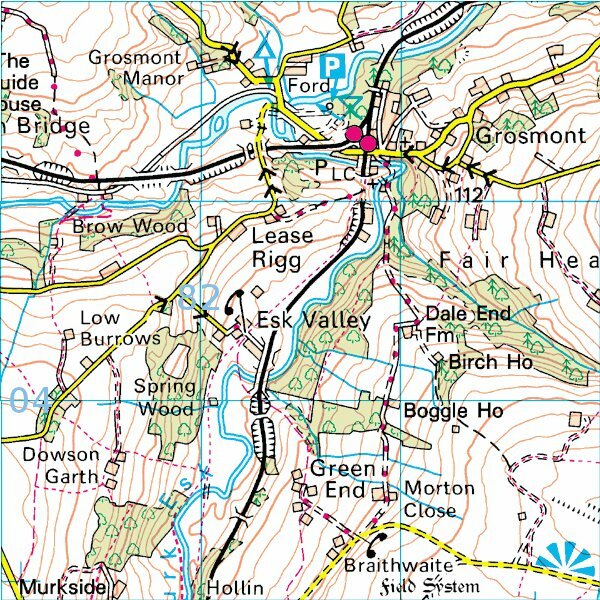 It is a very easy scenic drive suitable for any car and a lovely way to get to Grosmont Station and the North York Moors railway with its magnificent steam trains. At first it's easy to think you may have taken the wrong route as only a short way down the lane you come to closed farm gates. The lane continues through the gate and through the farmyard before passing through more gates and on through the livestock fields. Make sure you have a passenger who can negotiate the opening and closing of the gates whilst ensuring that the field occupants remain at the correct side. 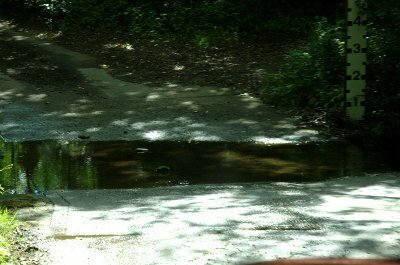 In total there are three fords on this lane and although the first one was only a trickle when we drove it (July 2011) the other two were much prettier. We found an area we could park and enjoyed the beauty of the stream and its surroundings whilst listening to the sounds and whistles coming from the steam trains at the adjacent station. 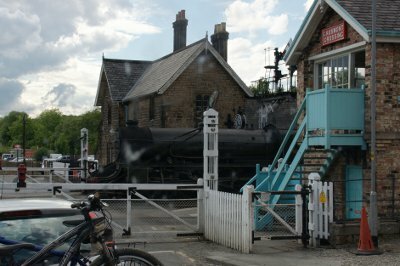 Climbing up from the last ford you arrive at Grosmont Station, well worth a visit if only to enjoy the tearooms. Continue through the level crossing and across the track. 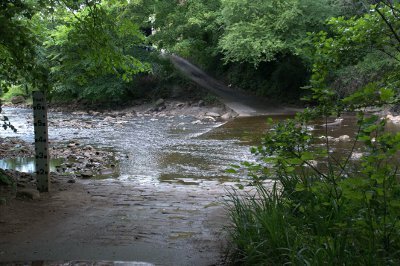 The road continues over the bridge across the river and bends to the right and it's easy to miss the short area of tarmac on the left just on the corner that takes you down to the ford across the river and up the Esk Valley. 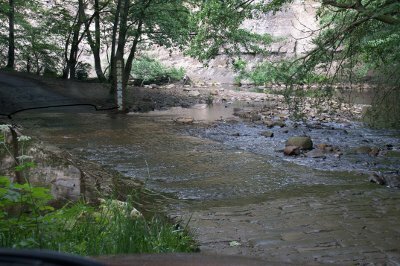 The river bottom is firm concrete but quite often the river is too deep and fast to cross. The North York Moors is a truly lovely place to visit with its contrasting dales and moorland and picturesque villages, roman roads and various fords scattered around. 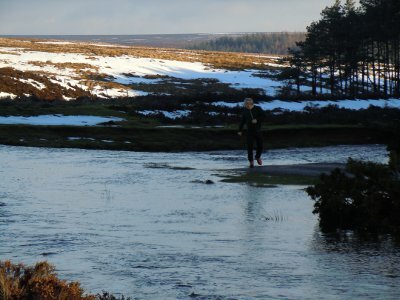 In winter the temperatures can fall very low and snow and ice soon make the roads completely impassable.In spring the melting snow turns the streams into rivers and the road and its ford disappear under the flood, too deep to cross by ordinary car.